CARACAS - President Nicolás Maduro has threatened to jail Kimberly-Clark executives by soliciting an Interpol red notice after the US paper products company shut down production in Venezuela last week. Kimberly-Clark’s factory in the city of Maracay has been seized by the state and turned over to its workers. 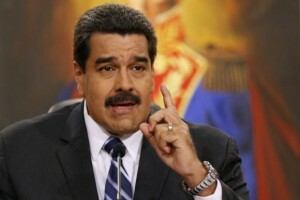 Maduro claims all production lines are in operation. But reports in the international media indicate that only one of the factory’s 11 production lines is active. Maduro alleged that Kimberly-Clark violated the rights of workers by shutting down the factory. He added that the company also failed to fund social benefits employees had been promised. According to Maduro, the closure of the factory in Maracay was illegal because the company fired nearly 1,000 workers without first consulting the government. “The ones who must go to jail will go to jail, wherever they are, because we will ask for a red notice from Interpol,” he said in a televised address, referring to unspecified Kimberly-Clark executives. Red notices are not international arrest warrants. They are a way for Interpol to inform member nations that an arrest warrant has been issued by a judicial authority that seeks the location and arrest of wanted persons for the purpose of extradition or similar lawful action. Interpol cannot send officers to arrest or compel member nations to arrest individuals under red notices. Venezuelan business group Fedecamaras estimates that 85 percent of the country’s industries were paralyzed in May due to a lack of raw materials. For its part, Kimberly-Clark said it had been grappling with soaring inflation and a shortage of hard currency and raw materials for years. The company said in a statement that the deteriorating economic situation had made it “impossible to continue our business”. “If the Venezuelan government takes control of Kimberly-Clark facilities and operations, it will be responsible for the well-being of the workers and the physical asset, equipment and machinery in the facilities going forward,” the American company added. The country has been mired in a deepening economic crisis under Maduro’s leftist government. There have been widespread shortages of basic goods, soaring inflation and rising insecurity. Shoppers now routinely spend long hours queuing in front of stores to purchase products ranging from toilet paper to rice. At the same time, companies face hefty losses on price-controlled goods. Products are often sold on the black market for many times their shelf price. There are now daily protests against the shortages in Venezuela. Well over 100,000 frantic shoppers flocked to Colombia in search of food at the weekend. The rush forced Colombia’s depleted stores to hurriedly restock by the truckload. The opposition blames Maduro for wrecking the oil-rich economy and is seeking a referendum to remove him.